Cardboard Critique: A blog dedicate to reviewing mostly Euro board games. All hail our robot overlords. For years, people have declared that the future of board games will see an increased utilization of smartphone apps and computers. I recently had the opportunity to playtest Latitude 90: The Origin, a fully digital board game (currently funding on Kickstarter). Rather than sit around a table with cards and tokens, a dozen of us stood in a large circle and logged our smartphones in to a game server. You are an Antarctic Researcher, part of a team of elite scientists posted at an Antarctic Research Station. An ancient life form, trapped beneath the ice for millennia, has infected one of the others, taking their form and hiding in plain sight. It is the most powerful Infected Master, and it calls itself “The Origin.” To figure out who the Infected Masters are, you and your fellow Researchers will use all your training as scientists — Isolate biological samples, conduct experiments to gain clues, and perform tests on your “teammates”, but be careful! The Infected Masters can spread their Infection through their own biological samples, taking over the Researchers’ bodies, and turning them into their Infected Minions. Players are broken into two separate teams at the beginning of the game: Researchers and Infected. 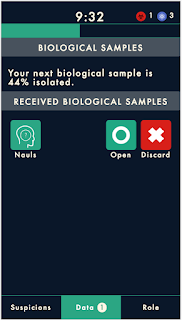 Most players begin as Researchers while only a few are Infected. Much like the games Werewolf and Mafia, the Researchers (townspeople) do not know who the other people on their team are, while the Infected (werewolves/mafia) do. 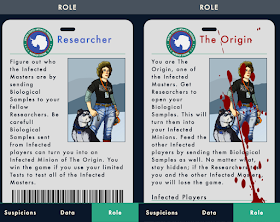 Role cards for the Researcher and "The Origin"
At the start of the game, the Infected team are dealt special Infected Master roles: The Origin, and Corrupter[s]. The Researchers’ goal is to quarantine the Infected Masters. The Infected have a simple goal: avoid detection. 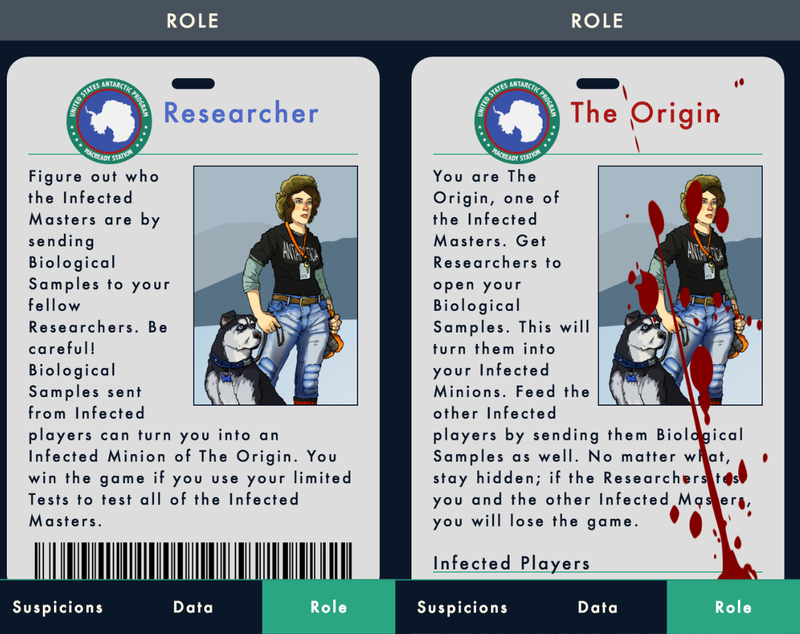 Both the Researchers and the Infected further their plots by sending players Biological Samples throughout the game. Unlike the familiar Werewolf games, there is no player elimination; the Infected do not kill the researchers, and the Researchers cannot lynch/kill the werewolves. Instead, The Origin’s sample can infect unwitting Researchers. This infection converts those pesky Researchers into Infected allies (but not Infected Masters). Yes, your team can (and often will) change in the middle of the game. Newly infected researchers cannot contaminate other researchers. However, if The Origin sends Infected teammates additional biological samples then those Infected teammates become contagious too, and can help spread the infection. To combat this, Researchers can quarantine suspected Infected Masters. This requires a vote from the Researcher players. If successful, it reveals and disarms Infected Masters. However, the Researchers must be careful because they are limited in the number of quarantines they can initiate. If they do not quarantine all Infected Masters by that limit, they are overwhelmed and lose the game. So, how do Researchers know who to quarantine? They open test samples from other players to receive information. 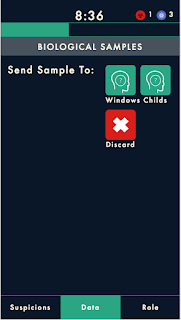 Each player can send 1 test sample every minute during the game (a game lasts 10 minutes). Every time a player opens a test sample, they’re betting against it turning them into one of the Infected. If they are not infected, they receive information about the other players. For example, they may discover that a specific player is still a Researcher, or that certain players were not Infected at the beginning of the game (and thus cannot be Infected Masters). This information is sent directly to the phone screen of the person who opened the sample. It is then their job to disseminate it to the rest of the group. While they are sharing their information, the group has to decide what information is correct versus what information are lies from Infected team members. While phones are used to send/receive samples, track suspicions, and quarantine Infected Masters, this takes up little time. Playing the game through a server allows for real-time information flow that would be impossible without a moderator. Also, by removing the need for a moderator, the game plays much faster than its Werewolf/Mafia predecessors. Like other social deduction games, most time is spent processing and discussing the known information and its implications. An early sample that says at least one of three specific people are Infected is a huge boon to the Researchers, but often that information is only useful much later and in combination with additional sampling. At first, it was frustrating that information can become obsoleted (perhaps Jim is no longer a researcher after all, so maybe I can't trust their biological samples! ), but the game balances this by only requiring Researchers to quarantine the original Infected team. 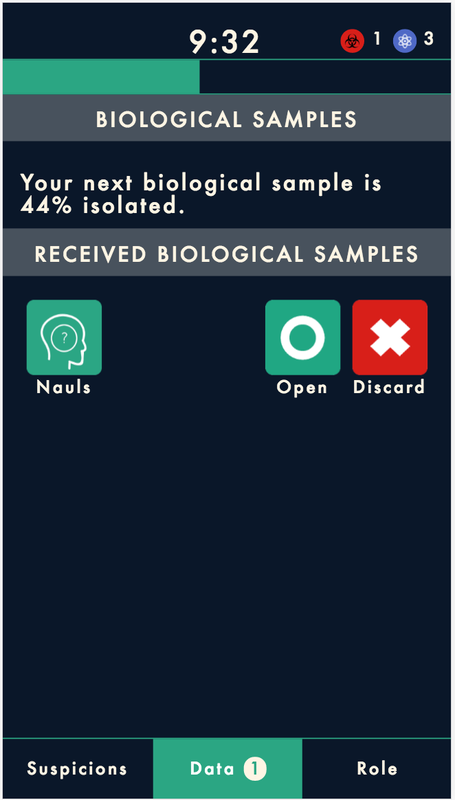 One potential concern with the game is that there's little incentive not to open all Biological Samples. If the sample is clean then you gain information regarding the other team's activities; if the sample is contaminated, then you switch to the other (currently winning) team. Latitude 90: The Origin takes advantage of smartphones’ ubiquity without losing the essence of its Werewolf/Mafia social deduction roots. The game automatically scales for any number of players (3 to 20+). Additionally, purchasing a $10 copy of the game is like "buying the box" -- only one person is required to own a copy of the game in order for any number of friends to play. I found the game to be as interactive, challenging and rewarding as The Resistance or One Night Ultimate Werewolf, while providing a unique experience due to the use of smartphones. 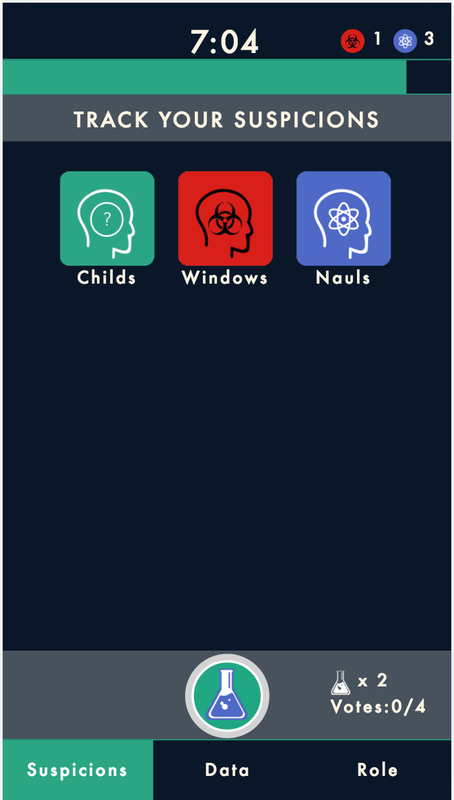 I highly recommend looking into this game if you're a fan of social deduction games.